These Sea Fans are not a protected species. They are grown thru aquaculture. 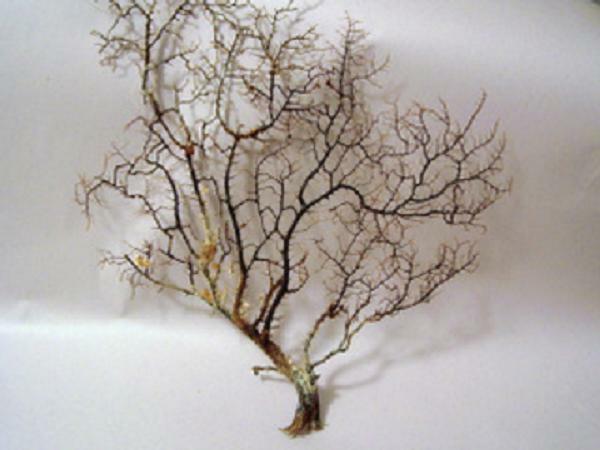 The Sea Fan is a Gorgonian. Individual tiny polyps form colonies that are normally erect, flattened, branching, and reminiscent of a fan. Others may be whip like, bushy, or even encrusting. A colony can be several feet high and across but only a few inches thick. These colonies may be brightly colored, often purple, red, black or yellow. Photosynthetic gorgonians can be successfully kept in captive reef aquariums. 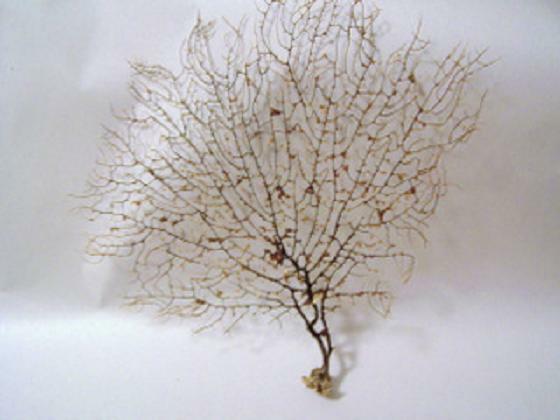 These are the only Sea Fans that are safe for aquariums. 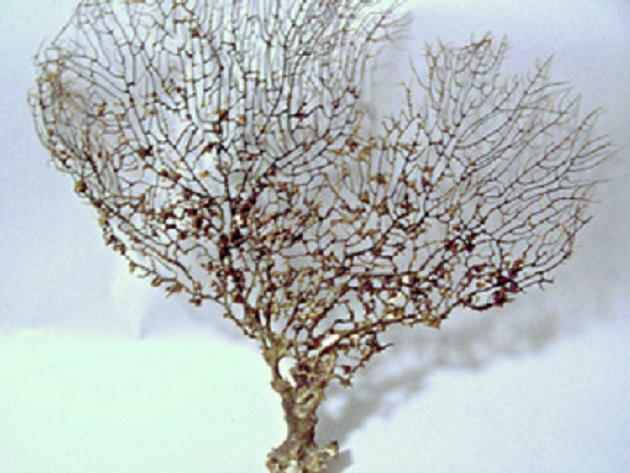 The structure of a gorgonian colony varies. The suborder Holaxonia skeletons are formed from a flexible, horny substance called gorgonin. The suborder Scleraxonia variety of gorgonians are supported by a skeleton of tightly grouped calcareous spicules. There are also species which encrust like coral. Most of holaxonia and sclerazonia, however, do not attach themselves to a hard substrate. Instead, they anchor themselves in mud or sand. Each gorgonian polyp has eight tentacles which catch plankton and particulate matter that is consumed. 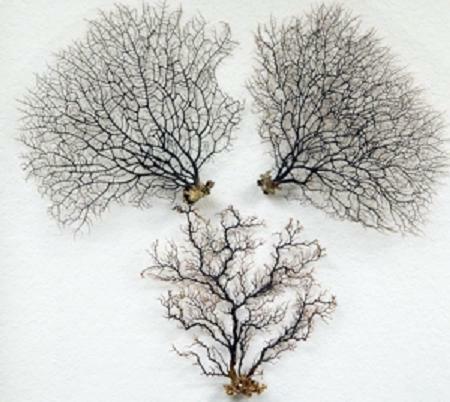 This process, called filter feeding (you will likely receive a fan with residue) is often on the arms (branches), is prompted when the fan is spread across the ocean current to maximize water flow to the gorgonian and generate its food supply. If you prefer a flattened fan, you can rehydrate the fan by submerging it in water for 24 hours. This makes the fan flexible. 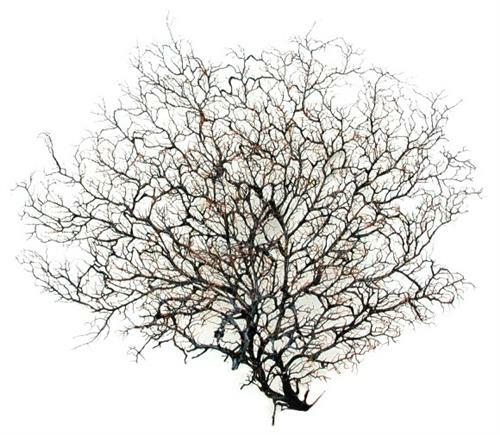 You can then flatten the branches by placing a heavy weight over the area that needs flattening and allow it to dry out again. This redrying takes another 24 hours. If the fan is ragged, they can be trimmed and shaped with shears. Gorgonians are found primarily in shallow waters, though some have been found in depths of several thousand feet. The size, shape, and appearance of the gorgonians are highly dependent on their location. The more fan-shaped and flexible gorgonians are generally found in shallower areas with strong currents; the taller, thinner, and stiffer gorgonians tend to be found in deeper, calmer waters. Gorgonians are classified in the phylum Cnidaria, class Anthozoa, alongside the orders Alcyonacea (soft corals) and Pennatulacea (sea pens). There are about 500 different species of gorgonians found in the oceans of the world, primarily in the shallow waters of the Atlantic near Florida, Bermuda, and the West Indies. Most aqua-farmed fans, like these tend to be within the 7 to 14 inch range. the larger fans take time to grow and the price reflects this.